In the Settings administration screen are all of the settings that define your website as a whole. These settings determine the way your website works. Also it regulates how you and the rest of the world interacts with it. You can access the Settings administration screen by going to the bottom left side of your menu on your Dashboard. There is inline help in all sections of the Settings administration area. You can access further information by clicking Help at the top right of your screen. When you make changes to your settings, don’t forget to click the Save Changes button at the bottom of each settings screen to ensure that the changes you have made are saved to your database. This is the default screen in the Settings administration section. It controls the basic configuration settings for your site. More specific,in this section you can enter the name of your website which is usually displayed at the top of every page. You can also add a tagline that reveals what your site is all about in a few words. Set the URL where your WordPress core application files and website are located. The E-mail Address field should include the email address you want WordPress to send messages regarding the administration of your site. You can choose whether visitors will be able to register an account at your site, as well as what is the default role for new users. 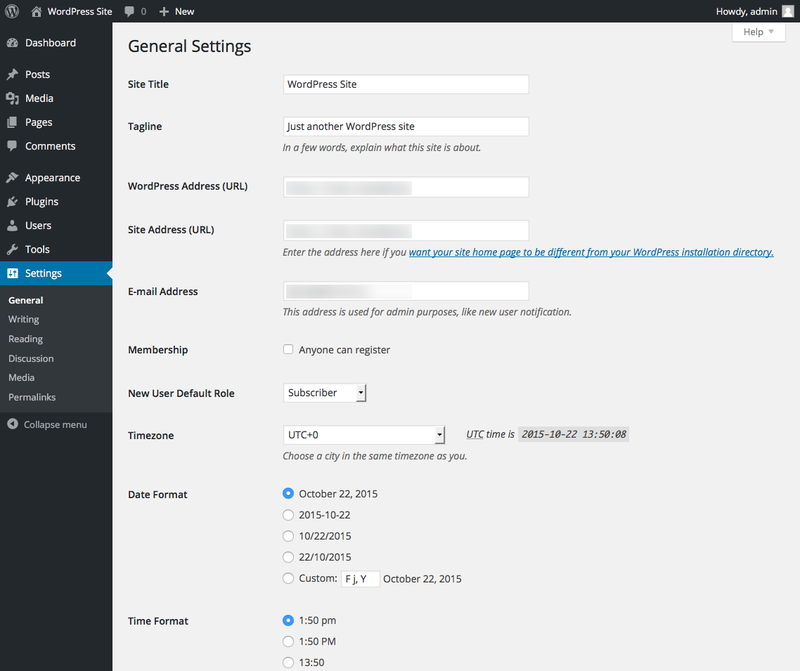 Finally, you can select the time and date format, as well as the WordPress Dashboard language. Use these settings to control the interface used when writing new posts. You can choose the default post category and format. 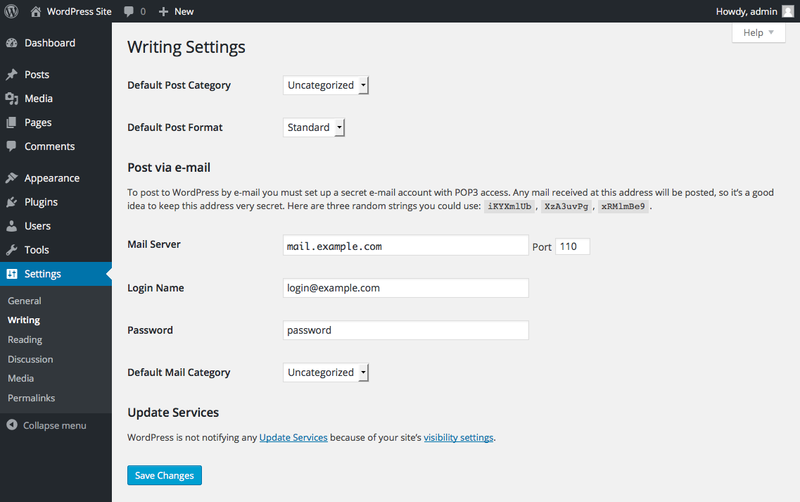 Also, you can set up a special email account that will be used in order to publish emails as blog posts. 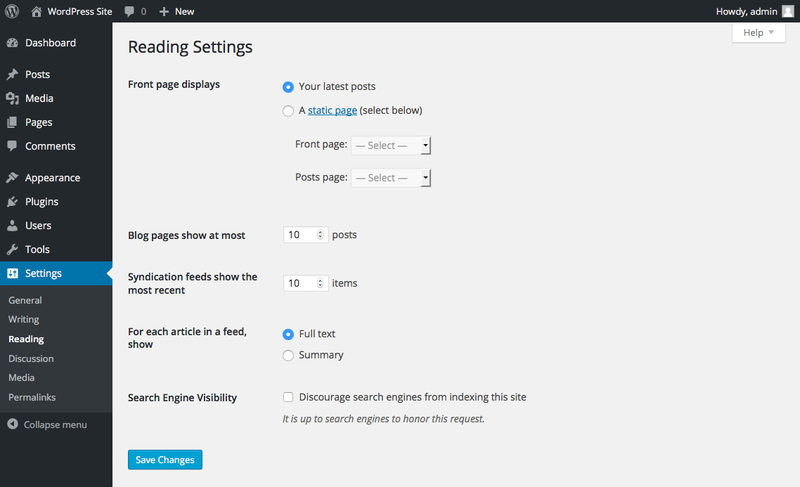 You can use these settings to determine how content is displayed on your website. Choose between displaying either your latest posts or a static page as your home page. Enter the number of posts you want displayed per page as well as the number on your website’s feeds. Choose whether a summary or the full text of each post will be shown in a feed. Finally, if you want your site to not be included in search engine results, check the relevant box. 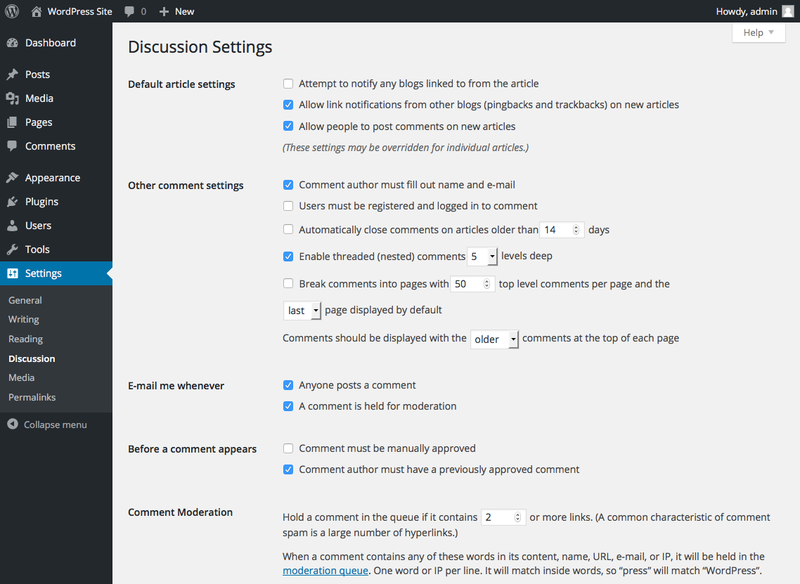 This particular settings screen allows you to modify the options concerning comments. From here the administrator decides whether comments are allowed, if pingbacks & trackbacks are acceptable, plus what constitutes comment spam. On this screen you also control under which circumstances your website sends you notification emails when certain events take place at your website. Use this screen to control the various settings related to images and other media that are used in posts and pages. 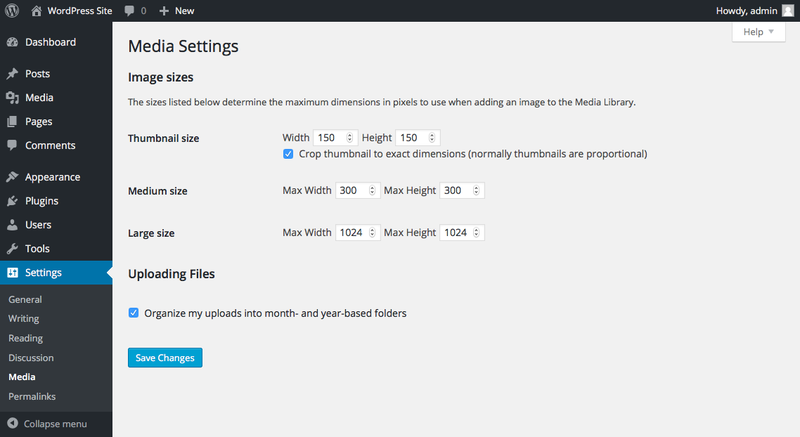 Determine the width and height of the various image sizes that WordPress generates when you add images to your Media Library, such as the thumbnail, as well as the medium and large sizes. Finally, check the related box if you want your media files to be organized into folders according the year and month of uploading. Permalinks are the permanent URLs to your individual pages and blog posts, as well as to your category and tag archives. A permalink is the web address used in linking to your content. The URL each post has must never change. 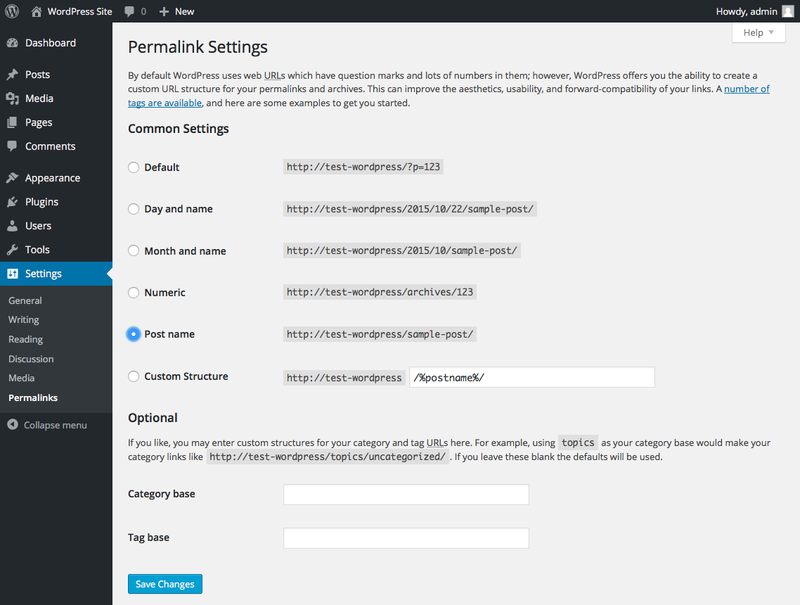 The Permalink Settings screen allows you to choose your default permalink structure. You can choose from common settings, such as numeric, day and name, month and name, or create custom URL structures. It is advisable to use a custom URL structure for your permalinks and archives, as this can improve the aesthetics, usability, and forward-compatibility of your links. 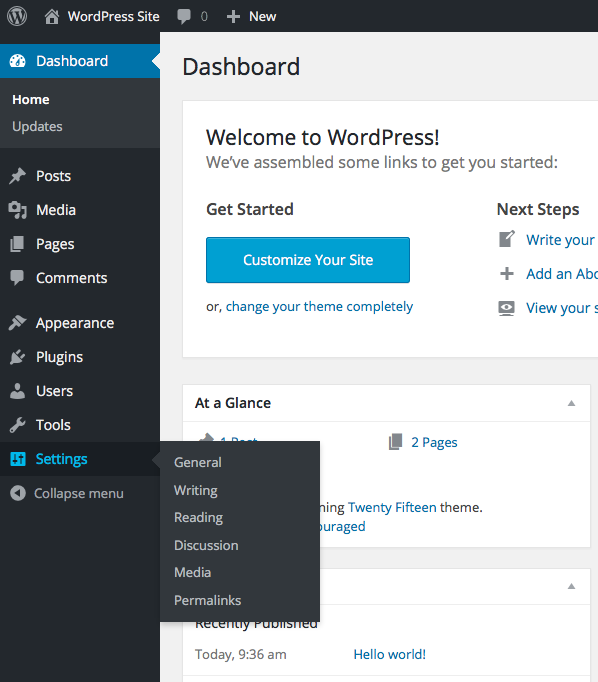 The WordPress Codex includes a detailed list of the tags you can use to set your permalink structure.